London (CNN) -- Imagine a skyscraper that cleans the air. You won't have to wait long -- two will soon be built in China. 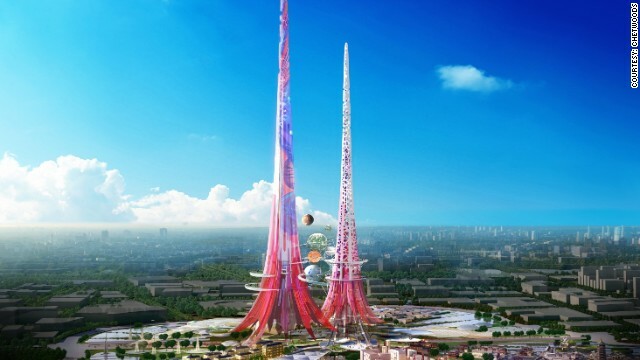 The world's tallest towers, futuristic pink spires that "breath life" into the environment, are due to begin construction within two years. The ambitious Phoenix towers were designed by London-based architects Chetwoods and will claim the tallest building title from Dubai's Burj Khalifa. And the design goes one step further: The towers will be one of the world's most environmentally-friendly buildings. Stretching up more than a kilometer into the skies above Wuhan, the capital of China's Hubei province, the Phoenix project aims to clean the air and water from its surrounding areas. It's expected to become a tourist attraction for both Chinese and international travelers. At more than one kilometer high, the Phoenix Towers in Wuhan will be the world's tallest building when they are complete. The inspiration for the towers has come from Chinese culture, drawing on its use of the phoenix as a metaphor. The London-based architects group Chetwoods say the towers will become a landmark environmental project. 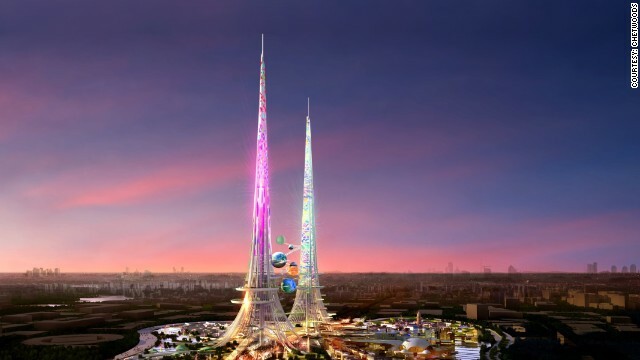 The towers will glow in vibrant pink, as a nod to the fuchsia flower. Building is due to start in 2016 -- and the aim is for people to "have their breath taken away." The chimney, heated by the sun, will draw air from across the lakes and use it to cool the buildings. Chetwoods chairman Laurie Chetwood told CNN the project is more than just an architectural statement. It's also about preserving the lakes of the region, he said. "You can imagine the pressure those lakes are under, [with] a huge dense city growing around them," he said. "So we thought we could not only attract attention with the towers but also breathe life, literally, into the lakes." The architects have looked to the natural world for inspiration, building a "thermal chimney" in the center of the taller tower. The chimney, heated by the sun, will draw air from across the lakes and use it to cool the buildings. The air will then be filtered and churned back into the environment cleaner than before. The buildings will do the same with the water, tantamount to "putting air back into the water like in a typical fish tank.... but we're also cleansing the water and putting it back," Chetwood said. 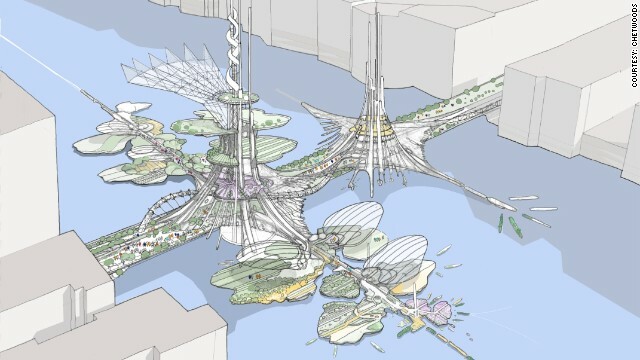 The towers have also drawn on Chinese culture, reflecting its use of the phoenix as a metaphor. "It's two dragons or two birds -- one male, one female -- and we use this idea as a symbiotic idea, one feeding off the other for the benefit of all." 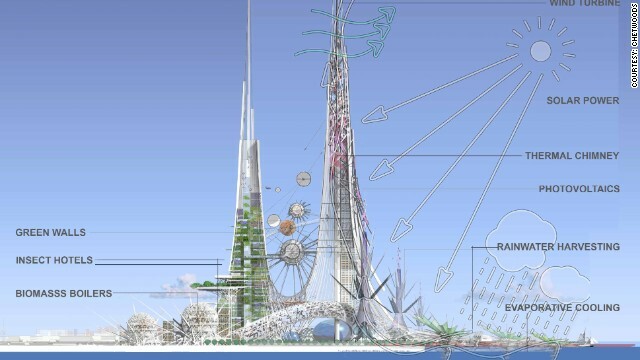 The taller of the two towers will accommodate a kaleidoscope, turned by a wind turbine, and creating what Chetwood hopes will be a "wonderful experience when you look up." Combined with photovoltaic panels, they produce electricity for the project -- with some spare for the district. The smaller tower will feature the world's tallest "green wall," or vertical garden, which will climb to the top of the tower. 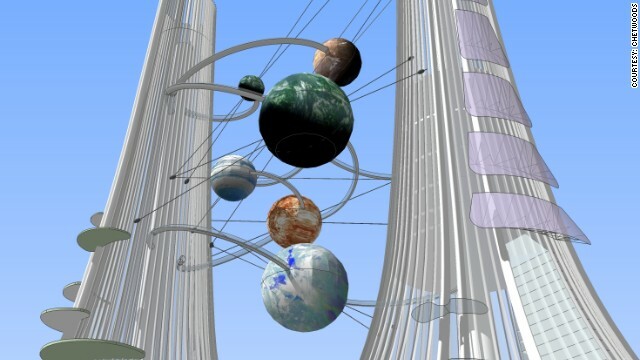 But perhaps the most controversial architectural feature are the huge celestial orbs strung between the two towers, housing restaurants and viewing platforms. The designs are unusual, the "sort of idea that China embraces, that perhaps somewhere else in the world they think you're going too far there," Chetwood said. 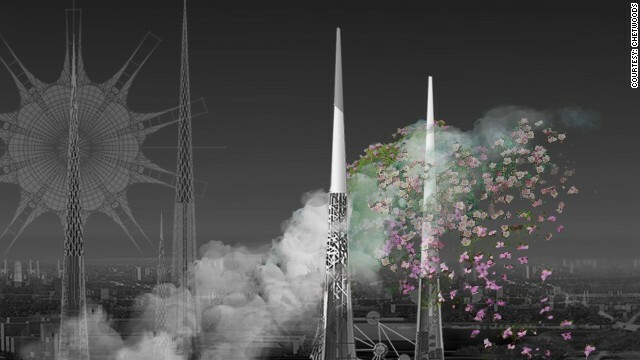 The towers will glow in vibrant pink, as a nod to the fuchsia flower. While architects often pivot to monochromatic colors, Chetwood wanted to mix it up with color. Also, he adds, "I hold my hands up and say I actually like the color and thought it would look stunning." Constructions starts in 2016, and the aim, Chetwood said, is for people to "have their breath taken away." Nina dos Santos is a news anchor and correspondent based in London. She is the host of CNN International's show The Business View. Why are Iraq oil markets stable? Usually, airstrikes, rebels seizing control of oil fields and refineries, plus a severe refugee crisis are a recipe for market panic. So why are Iraq oil prices stable? Europe's deteriorating relationship with Russia has hit the region's growth, even before new food sanctions begin to bite. Russia's beef with the west has escalated after the country banned foods from a host of Western nations including the U.S., Australia, Canada and those of the European Union. For months, the West has struggled to take a strong stand against Russia for its incursion into Ukraine. Now, its facing the reality that it will need to suffer too. Are Scotland and England better together or apart? Nina dos Santos explores the long relationship ahead of Scotland's vote for independence. Turkey's Recep Tayyip Erdogan has made history as the country's first directly elected president but his ambitious economic plans could be scuttled by the region's volatile geopolitics. Turkey's economy, fattened with foreign investment during its boom-times, has stalled amid warnings its model is unsustainable. The West has slapped stringent sanctions on Russia in response to the downing of Malaysia Airlines Flight 17. But is it still doing trade with Russia in weapons? Is this the real new black? Forget the new black. This is the real black. You can't see it, or figure out its shape, it's the darkest material in the world. Jibo robot is designed to be an organizer, educator and assist family members. CNN's Maggie Lake met him and says she was impressed with his skills. With cyberattacks on the rise and here to stay, it's a modern-day challenge for everyone to get smarter about preventing them. Britain will launch the world's first spaceport outside the U.S., with first space tourists blasting off from the UK as early as 2018. Imagine a skyscraper that cleans the air. You won't have to wait long -- two will soon be built in China. Iraq produces 3.3 million barrels per day and has the world's fourth-largest oil reserves. But the current crisis is putting all this in danger. Obama calls Europe, but who picks up? Who will lead the fractured European Union for the next five years? The question has caused weeks of bickering in already fractured EU. Sandwiched in between Iraq and Syria, Jordan's destiny seems to be one of a constant struggle for survival. John Defterios explains. The gas standoff between Russia and Ukraine could have a knock-on effect on Europe. Explore this map to find out why is the EU nervous. Bob Mazzer has photographed inside London's Tube network for 40 years. He's captured history.